On unseen poetry and comparing texts: royal adventures. As a Manchester United fan (the less said the better) and with running the Edinburgh marathon looming terrifyingly on Sunday, I was on the hunt for some solace this weekend. 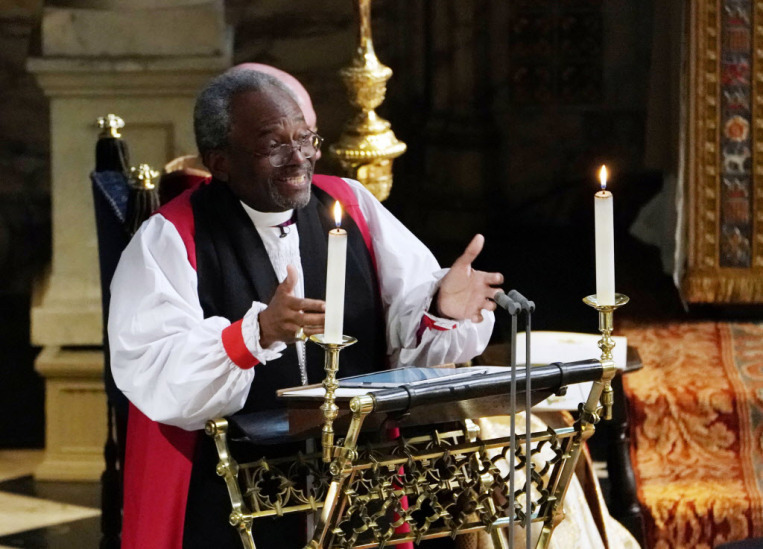 It arrived in the most unexpected of places: the wonderfully passionate speech of the preacher Michael Curry that stole the show at the royal wedding. A tragic glimpse into my dull life was that as I watched, my mind was instantly thinking about lessons: how could I use this brilliant evocation of love with classes? Year 9 would be the perfect foil for a spot of the creativity that is often desperately void in this busy exam fueled term. They have spent this half term looking at poetry, looking at building up approaches to exploring unseen poems and starting to tentatively compare texts. 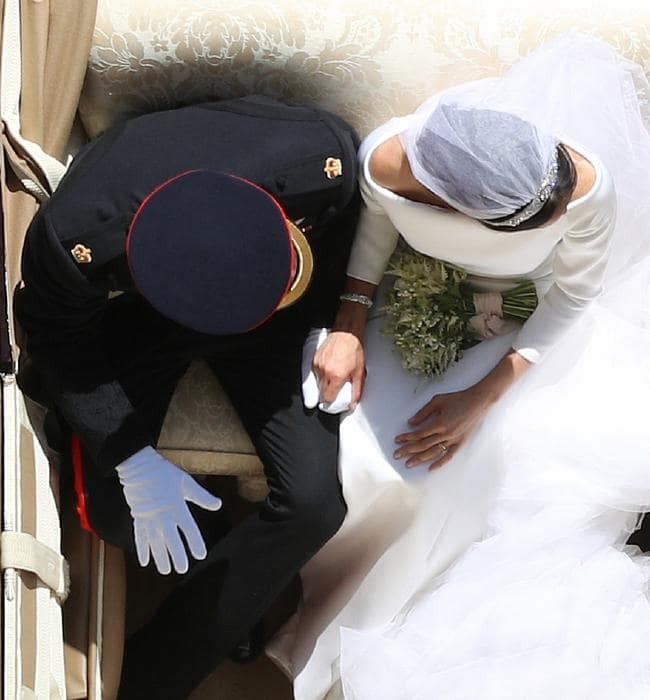 The students came in to this magnificent photograph, taken by Yui Mok that turned into an online sensation (he was apparently positioned on the roof of the George IV gateway, hence the interesting angle). This was combined with this rather lovely version of ‘The Power of Love’ by Gabrielle Aplin delightfully humming in the background. The students had post it notes in front of them and had to come up with words and phrases to connect the two. They came up with some basic enough links and points (passion, love, connections etc), then I gave them the Thomtastic vocabulary that I wanted to see them build into their verbal answers and writing in the rest of the lesson: idealistic, salvation, profound, moving, redemptive, private, utopian, joyous, unique, powerful, escapism, liberating. We unpicked and discussed the words before returning to the Aplin song and trying to apply them. After we had a brief discussion of the opening line, they went to annotate the first text in pairs, looking at how the words in the below extract evoked love. Their challenge was to use four of the Thomtastic words in their annotations. One thing we have been using this term is the idea of an unseen annotation champion – celebrating the best annotations on a first unseen reading. I then pick out and show that student’s annotations to the rest of the class. How is love presented in ‘The Power of Love by Gabrielle Aplin? I then combined these three extracts from the speech for students to explore in more detail, looking at how love is explored. Again their mission was to build in the vocabulary to their reading, with a particular focus on identifying the impact of word choice. “There’s power in love. Don’t underestimate it. Don’t even over-sentimentalise it. There’s power, power in love. “If you don’t believe me, think about a time when you first fell in love. The whole world seemed to centre around you and your beloved. “There’s power in love. There’s power in love to help and heal when nothing else can. “There’s power in love to lift up and liberate when nothing else will. “There’s power in love to show us the way to live. “Set me as a seal on your heart… a seal on your arm, for love is as strong as death. “But love is not only about a young couple. Now the power of love is demonstrated by the fact that we’re all here. Two young people fell in love, and we all showed up. “That’s what love is. Love is not selfish and self-centred. Love can be sacrificial, and in so doing, becomes redemptive. And that way of unselfish, sacrificial, redemptive love changes lives, and it can change this world. Exclamation “oh” – conveying passion and enthusiasm. Repetition of “power” demonstrating the significant force of love. Repetition of “any” to show that it is not just romantic love that has such significance. “Imagine this tired old world where love is the way”. Now for the tricky part – comparing the Gabrielle Alpin song with the speech. The class were slip into two, with one half looking to identify similarities and the other differences. They then fed back to each other about their findings. I jumped in with additional ideas. Again I then modeled the start of this paragraph to help them structure their response. The comparative phrases I wanted them to use were identified in bold. They had ten minutes to write a response with only their notes and annotates to help, that looked specifically at the similarities between the two texts. The exploration of love is similar in both texts, with both emphasising the unique influence that love can have. In Alpin’s ‘The Power of Love’ she urges readers to: “make love your goal”, while Curry similarly warns us to “not underestimate love”. Another clear parallel is that both frequently repeat the important phrase: “the power of love” that reiterates their message about the redemptive nature of love. We ended the lesson with their vocabulary passes: with students having to use one of the words from the start of the lesson correctly in a sentence to “escape” for their lunch. “My cheese baguette is going to be a redemptive experience” was my particular favourite! It wasn’t rocket science, but it was a lesson that I enjoyed sitting down, thinking about and constructing. As exam lethargy seeps in I have found my teaching becoming rather mechanical this half term and I enjoyed the injection of energy that comes with the planning and delivery of something new. Perhaps this is end of term hyperbole and delirium setting in (did that inspire a lesson on “the power of love? !”) but that surely is something to cherish and celebrate: the unique and creative opportunity of English teaching. 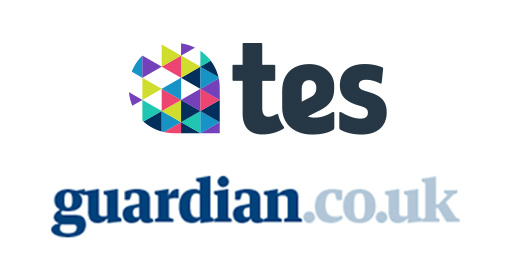 What other profession can lay claim to giving the opportunity to give such creative licence, all in the aim to inspire genuine thinking and moving young people? The joy of this is something we need to shout more about, in part for our own sense of professional satisfaction and more importantly to encourage the next generation of intrepid English teachers to embrace the creativity and energy of teaching! Thanks for reading. I am running the Edinburgh marathon this weekend to raise money for my inspiring friend Drew Graham, who was paralysed in an accident and has since set up a charity (http://popupgym.org.uk) in the North-East to provide support for people with disabilities. Any support on this link would be massively appreciated!